Don Welch steers the ship of this $50 million re-markable revitalization project utilizing shipping containers in downtown Las Vegas. The image above is courtesy of inhabitat.com and is a drive-thru Starbucks in Washington state. This structure consists of four shipping containers and was dubbed the “Reclamation Drive Thru”. Do you think they’ll serve folks on bicycles as well? According to the article at inhabitat.com, they’ve also integrated rainwater harvesting. I tip my hat to any aspirations to implement sustainability… especially with GIANTS like Starbucks. 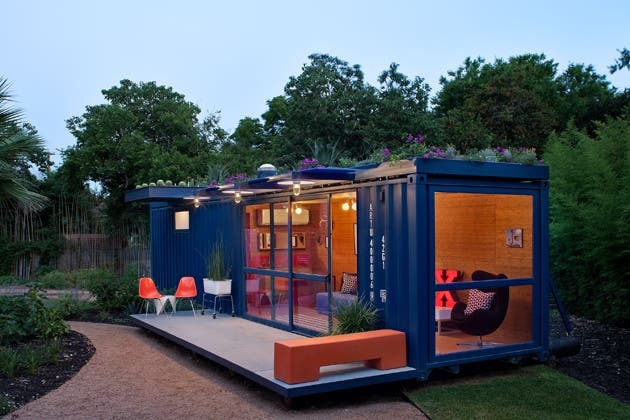 Here is another innovative re-use of shipping containers. Adidas designed a pop-up retail store for the Boston marathon in April of 2012 . The mobility was ideal for this temporary retail front. The images above are of Kohler’s booth for the “Dwell on Design” design fair. Hard to think this shipping container traveled across oceans and railways. I’ve also been reading about Stockbox Grocers, a start-up business in 2011, that is attempting to bring healthy produce to urban food deserts. What is a food desert you ask? It is an area, usually urban, where the community lacks easy access to affordable and nutritious food. Check out their design concept & first storefront below. The co-founders of Stockbox Grocers are Carrie Ferrence and Jacqueline Gjurgevich of Seattle, Washington. These super-cool girls are graduates of Bainbridge Graduate Institute’s MBA program where they studied sustainable business entrepreneurship. Of course they needed seed money for their pipe-dream and were able to raise $20,000 through Kickstarter. KickStarter is a funding platform for creative projects. It is a pretty phenomenal site that connects regular folks willing to invest with innovators, artists and entrepreneurs. You should very much check it out! The inter-modal container (shipping container) is a logistical product of international transport packaging. At times, it is less expensive for companies to produce a new shipping container than to ship them back to countries like Asia for reuse. Of course the answer to this quagmire is trade balance, but until then what? So what do we do with an 8,000 pound box of steel? Introducing shipping container architecture. 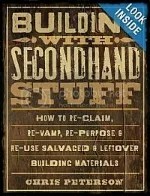 The images above are courtesy of a tinyhouseblog.com. Wouldn’t these be lovely to have as a design studio in your back yard or for a weekend getaway on the lake? Of course due diligence should be incorporated before beginning such a project, such as toxicity of the container, insulation needed, etc. but I’ve got to admit…I like the re-imagining aspect of this! What do you think?